The clinical symptoms of methylmercury intoxication, known as Hunter-Russell’s disease and Minamata disease, are characterized by sensory and visual disturbance and cerebellar ataxia. Various animal models have been introduced to study the toxicopathological effects on the nervous system (Berlin et al., 1975). In our previous study (Sato et al., 1976; Sato and Ikuta, 1976), the selective vulnerability of the central nervous system was also demonstrated in monkeys intoxicated with methylmercury. 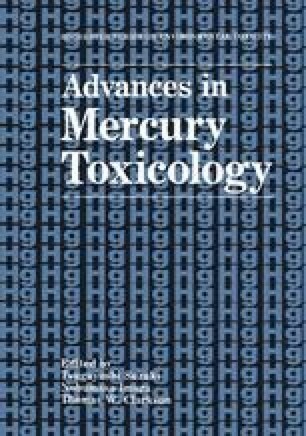 We reported that early changes detected in the nerve cells by electron microscopy were a very sensitive indicator in determining the minimal toxic dose of methylmercury. In this paper we review the minimal toxic dose of methylmercury in monkeys and the selective vulnerability of nerve tissue in experimental animals. To determine the minimal toxic dose of MeHg in monkeys we administered daily 0.2 mg/kg to 4 monkeys for 56–133 days and 0.03 mg/kg to 5 monkeys for 87–331 days. It was demonstrated that 0.03 mg/kg daily (total 3.6–9.0 mg/kg) of MeHg is a toxic enough level to produce ultrastructural changes in the central nervous system. To observe early changes in the central nervous system of monkeys and cats intoxicated with low doses of MeHg, an electron microscopic study was carried out and revealed specific ultrastructural changes in the neurons of the lateral geniculate body, calcarme cortex and in the granule cells in the cerebellum. In order to ascertain whether the transmitter binding receptor in the central nervous system is affected in cats with or without symptoms, which were administered toxic and subclinical doses of MeHg, we examined the histological alterations associated with MeHg intoxication and then compared these with the influence of MeHg upon the binding of [3H] WB-4101, a potent alpha 1 norepinephrine receptor antagonist, to the occipital cortexes of 7 cats. We found a markedly decreased receptor affinity for alpha 1 norepinephrine in the membrane fraction of the occipital cortex intoxicated with MeHg.